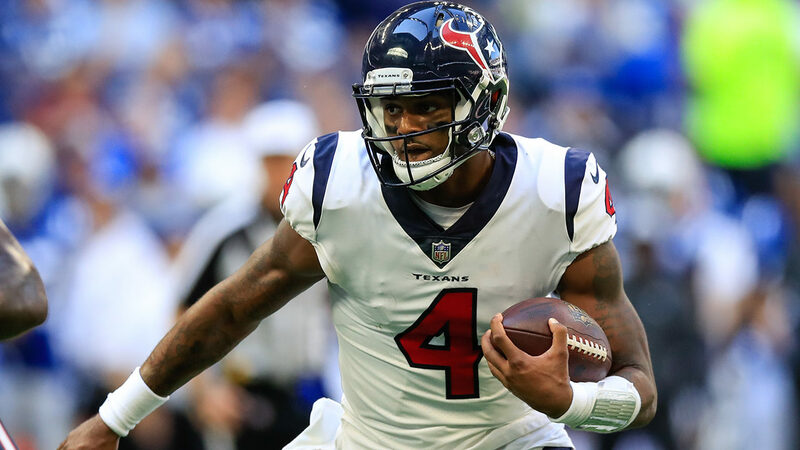 The Houston Texans are in a much different place now than the first time they faced the Indianapolis Colts this season when they were 0-3 and desperate for a win. Ka'imi Fairbairn made a field goal as time expired in overtime to lead the Texans to a 37-34 victory in that game and they haven't lost since, reeling off a franchise-record nine straight wins entering Sunday's rematch. Houston (9-3) led 28-10 in the third quarter in that first meeting before Andrew Luck threw three second-half touchdowns to rally the Colts (6-6) and set up the wild finish. The Colts failed to convert a fourth-and-4 with 24 seconds left in overtime to give Fairbairn a chance to win it. "Being up 28-10 ... and then letting them come back and being down in overtime and pulling through the adversity it kind of slingshot us to where we are now," Houston quarterback Deshaun Watson said. "That was one game where we went through all types of phases and situations that put us through this nine-game win streak. It was the start of everything." Defensive end J.J. Watt said that Sept. 30 game seems as if it was a long time ago and noted how difficult it has been for the Texans to win in Indy, a place where they're just 3-14 all time. "We needed one to get started. That was the one to get us started on this streak," Watt said. "Bit of an unorthodox way to get it, but we got it. So, here we are." The Texans are coming off a 29-13 win over the Cleveland Browns while the Colts were shut out 6-0 by the Jaguars last week to end a five-game winning streak. "The Jacksonville game was tough," Luck said. "They outplayed us. There's not much else to say about it. As a defense against our offense, they just flat outplayed us ... we took a good look at it and we'll improve. I know we will." Some things to know about Sunday's game between the Colts and Texans. TOUCHDOWN THOMAS Houston rookie tight end Jordan Thomas has a knack for scoring with four touchdown catches despite having just 14 receptions this season. His four touchdown receptions are tied with Andre Johnson for second-most TD receptions by a rookie in franchise history. The 6-foot-6, 277-pound Thomas has been a favorite target of Watson's in the red zone with all his scores coming on catches of 13 yards or less. NEW BALANCE Coach Frank Reich has stressed the need to find balance since he took the Colts' job in February. When these teams met previously, Luck set single-game franchise records with 40 completions and 62 attempts and became the 11th player in league history to throw for 450 yards and four TDs. He wound up with 464 yards, second in franchise history, and four scores. Since then, an improved ground game helped lessen the burden on Luck's arm - until last week when he threw 52 passes, including 14 straight during one stretch, in the loss to Jacksonville. Don't expect the Colts to be so one-dimensional in Houston. "You never want to have to drop back and pass it 52 times," offensive coordinator Nick Sirianni said. "We always want to run it more. Just in that scenario, the way we were running it, we had some plays on our call sheet that we felt were going to be good to hit, some chunks in the pass game and that's the way we went." THE BIG D Houston also will see a different defense. After allowing an average of 30 points over their first six games, the Colts cut that number to 16.8 points over the past six. Indy is the only team to have forced at least one turnover in every game this season, is second in the league in tackles for loss (71.0) and rookie linebacker Darius Leonard leads the league in tackles (122) and is tied for fourth in forced fumbles (four). First-year defensive coordinator Matt Eberflus sees it as a good start. "We feel we have set the standard of how we want to play in terms of the style. Now we just need to execute on a consistent basis and just keep doing that week in and week out," he said. "There are a lot of things that we have to improve on, but we have come a long way." DEANDRE'S ART On a TV show this week, Hall of Fame linebacker Ray Lewis said the way DeAndre Hopkins catches a football "is an art" and the Houston star agrees. "There's more to it than just going out and catching a football," he said. "There's a lot of factors that go on before that. It's for sure an art and repetition makes perfect." Hopkins routinely makes nearly impossible catches look run of the mill and Watson has said that he believes Hopkins will catch anything he throws his way. His latest nifty catch came last week against the Browns on a 24-yard reception near the sideline that came after T.J. Carrie grabbed his dreadlocks to try and slow him down. Hopkins knows that he makes it look easy, but wanted to make clear that it is not. "It's harder than people think," he said. "Especially like me I usually have a defender on me or close to me so catching the football isn't easy for me like it is for some people who are wide open. It's a challenge for me to play through that and still catch it."